Yael Roseman was born in Ramat Gan, Israel, in 1942. 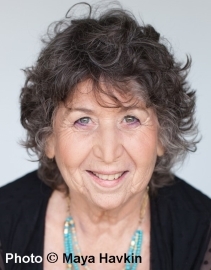 She spent her military service and early 20s living and working on a kibbutz. In 1967, she moved to Jerusalem and studied occupational therapy. In the early 1970s, she was also actively involved in the fledgling Israeli Women's Movement. After writing a play for an amateur puppet theater, Roseman was asked to work for Israel Television. She became a scriptwriter for children's programs and led creative writing workshops for children and teenagers. In 1981, she moved with her family to a small village in the Galilee based on ecological principles. She now lives in Tel Aviv. Roseman has published books for children and youth and short stories for adults. She has received the Ze'ev Prize three times (1982; 1992; 1997).